One of the stomp rockets, “Samoa,” named after the famous Girl Scout cookie. 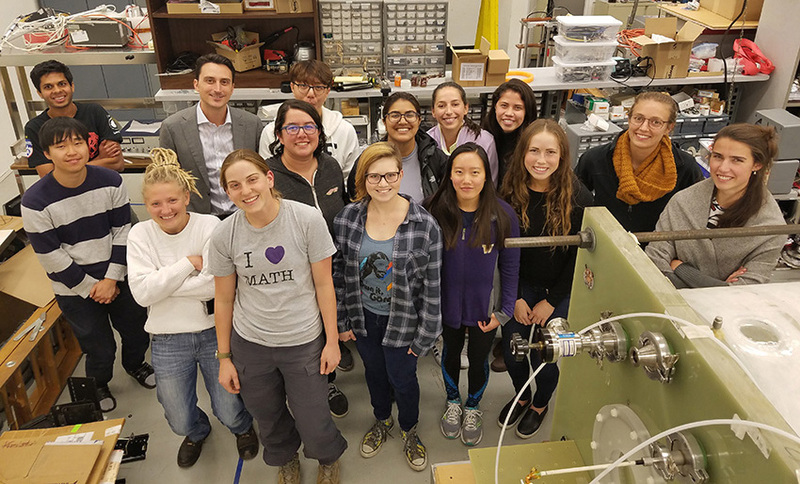 As the newest engineering club at UW, founded in 2017, Women in Aerospace has been getting traction engaging girls in elementary and middle schools. 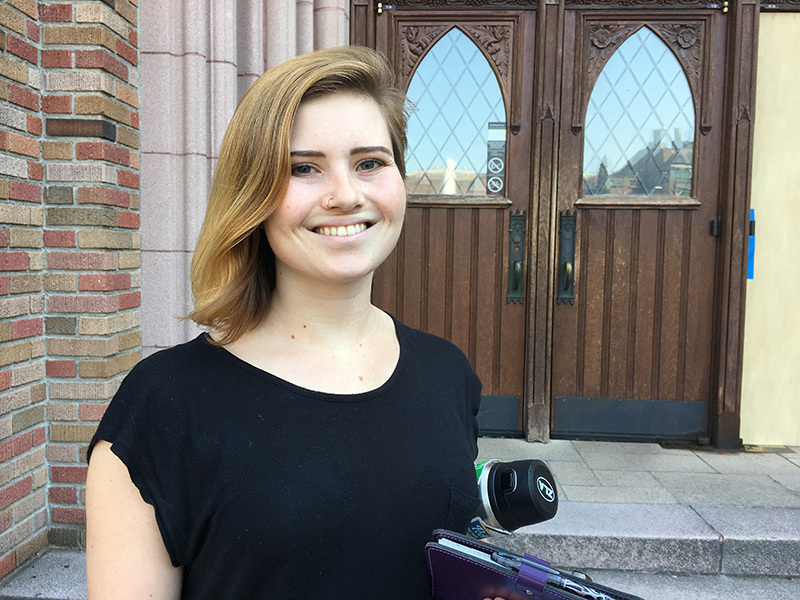 With approximately 20 members, they have been reaching out to organizations in the Seattle area for opportunities and potential partnerships. And they have been met with enthusiasm. For the club, the Girl Scouts are a timely and receptive audience. With the appointment of former Jet Propulsion Labs rocket scientist Sylvia Acevedo as CEO of the Girl Scouts in 2017, the organization has a greater urgency to emphasize science and technology. New badges have been released this year in Engineering, Computer Science, Space Science, Robotics, and Mechanical Engineering. Women in Aerospace specializes in a range of sharing sessions and activities to groups like the Girl Scouts. Over the summer, they visited Camp River Ranch outside of Seattle for a weekend workshop. 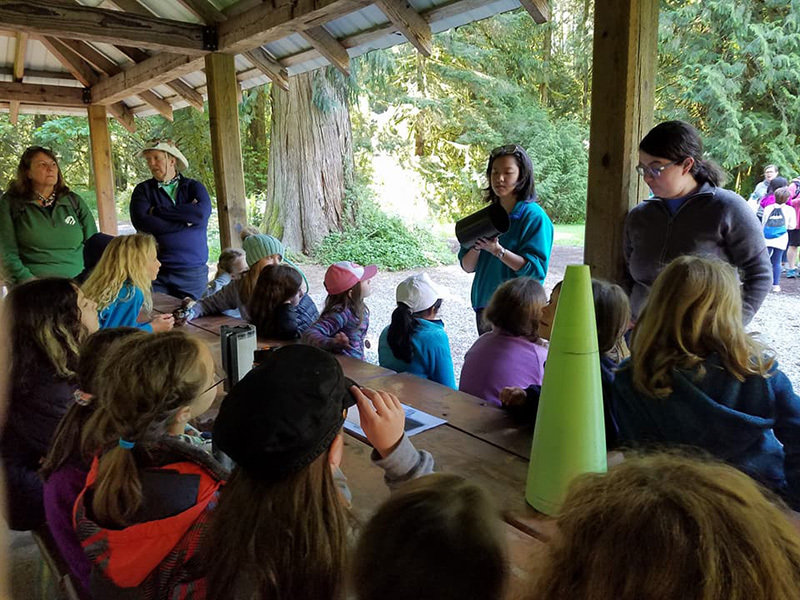 A few Women in Aerospace members who had participated in SARP, the rocket club at UW, taught the girls about propulsion and facilitated making stomp rockets. 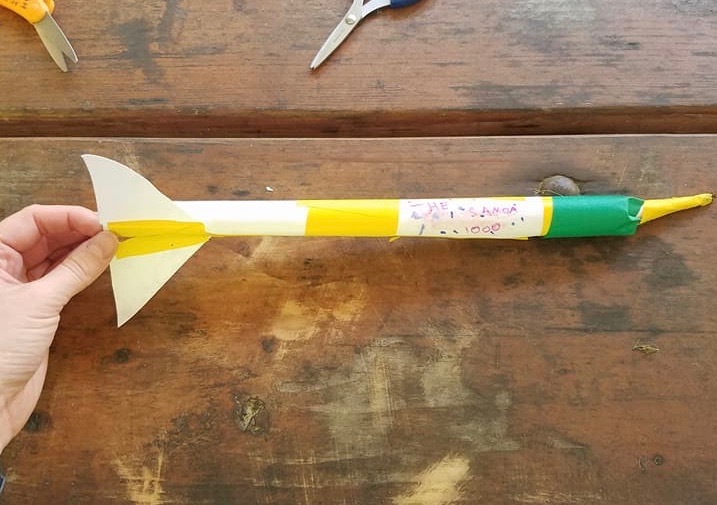 The girls built their own rockets, learned about how to make the nose cone and fins more effective, and put a lot of thought into naming their creations. Women in Aerospace scribe Nadiah Jenkins. Anna Sheppard fields questions at a Girl Scout meeting. 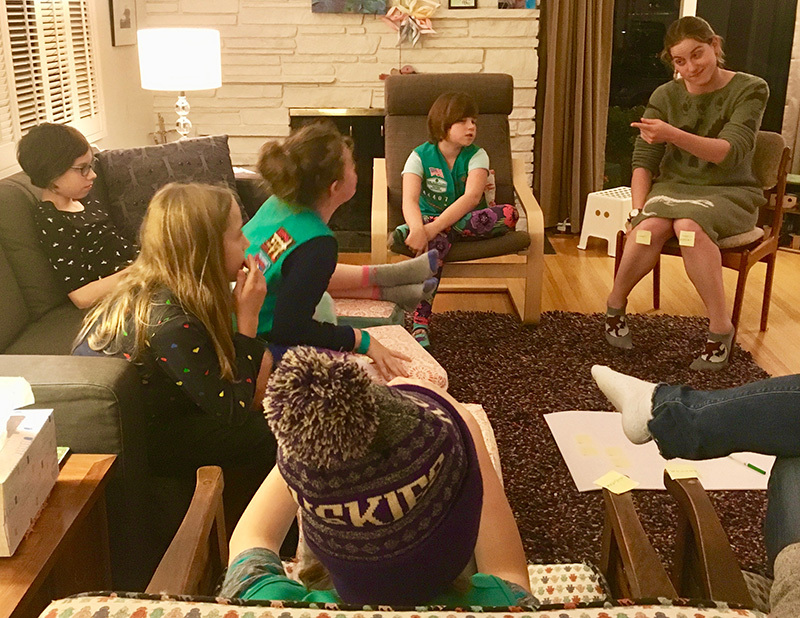 Anna Sheppard, the club’s treasurer, attended Seattle Girl Scout Troop 44407’s meeting as they started the aMUSE Journey badge series, focusing on all of the different roles women play and the accessibility and perception of those roles. Sheppard shared her experience of her ROTC training in college, being an officer in the Air Force, testing fighter plane engines, and joining the UW Aeronautics & Astronautics Department as a Ph.D. student. She also shared some of the gender dynamics she has noticed along the way. Women in Aerospace doing stomp rockets at the Girl Scout’s Camp River Ranch. 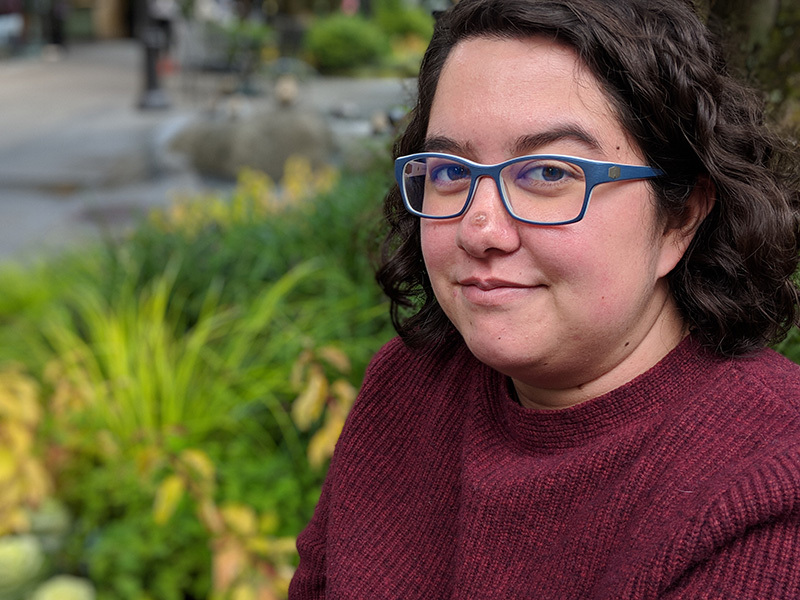 For her part, Sheppard says, “Growing up, I had no role models in engineering, and I think it's important to emphasize that the problems engineers face are ubiquitous. Engineering relies on many disparate fields that interest girls. There's math and science, sure, but engineering also requires design, coding, logic, creativity, construction, and trial and error. At the end of the day, engineering is fun, and that shouldn't be limited to just boys." As for the club’s outreach strategy, they are looking to engage more groups like the Girl Scouts and to build on their efforts at the Museum of Flight.